Apple has launched a new dedicated section in the Canadian App Store for apps and games in French, Apps et jeux en français, accessible via AppStore.com/AppsetJeux. 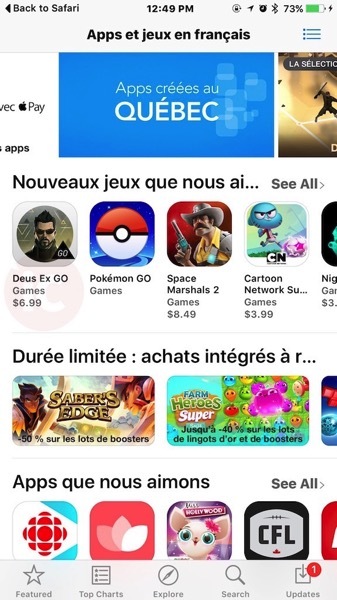 This French Canadian version of the App Store will get featured app collections, while highlighting apps made by major developers in Quebec, such as Ludia, illico, La Presse, Lara Croft GO, CBC’s Radio Canada and more. Apple also has some apps it wants to showcase, such as puzzle RPG Saber’s Edge developed by Montreal-based Hibernum; Square Enix Montreal’s Deux Ex GO; Réseau Contact, a popular Quebec-only dating app; augmented reality app Montréal en Histoires – Cité Mémoire; and kids app Miss Hollywood: Lights, Camera, Fashion! – Pet Adventures. Click here to visit the dedicated French section in the App Store–it’s a permanent addition.